Optional cameras* enhance visibility for on-site tasks. Four High-definition 180/360-degree cameras displaying all sides of the truck. Class-exclusive** Trailer Reverse Guidance with visual guides along both sides for an enhanced view of where the trailer is going. Customer-placed rear trailer camera. And center high-mount stop lamp camera for viewing the pickup bed, helpful when hooking up to a 5th-wheel or gooseneck hitch. 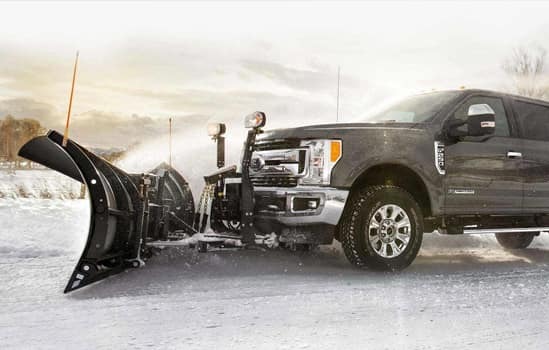 Ford Super Duty® provides the tools you need to finish any job, day or night. The available class-exclusive* BoxLink system has structurally reinforced box sides for attaching and tying down various kinds of cargo. 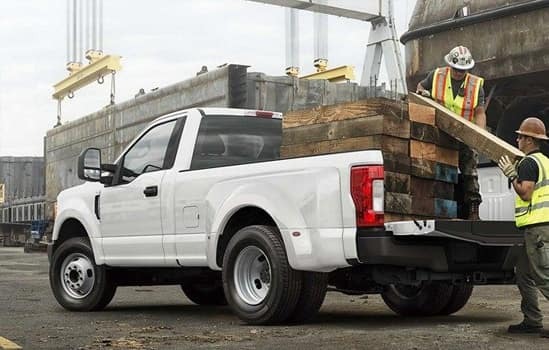 The four interface plates can be configured to accommodate many available Ford and aftermarket accessories from aftermarket storage bins to stowable loading ramps. The four lockable, removable cleats provide additional locations to tie down cargo safely and securely. And that’s not all. 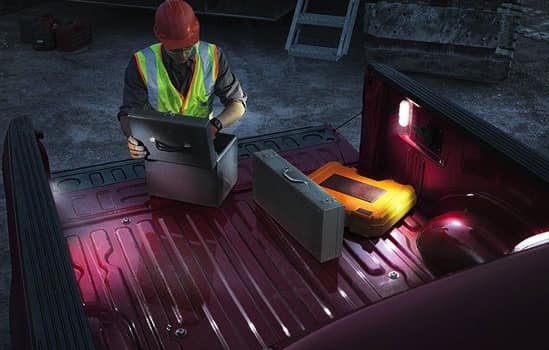 Working after the sun sets is no problem with the available LED lamps illuminating the box. Available Adaptive Cruise Control slows you down as traffic ahead slows, then resumes the preset speed when traffic picks back up. The Collision Warning/Brake Support feature precharges the brakes for full responsiveness. if you don’t react in time. 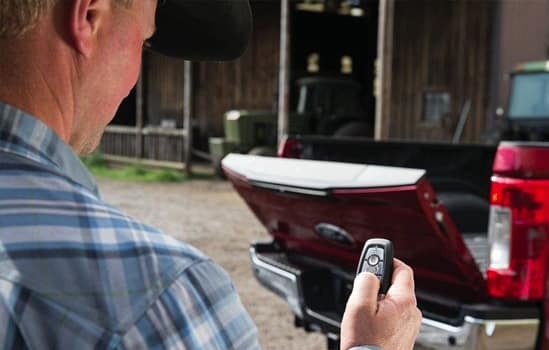 It’s integrated into the trailer brake controller for added security when you’re towing a heavy load. Compressed natural gas (CNG) and propane are advanced fuel options to unleaded gasoline with the CNG/Propane Gaseous Engine Prep Package,* available on the 6.2L gas V8. What’s more, the CNG/Propane Package with the addition of the necessary upfits for bi-fuel capability enables the 6.2L V8 to run on either liquefied propane gas or unleaded gas. 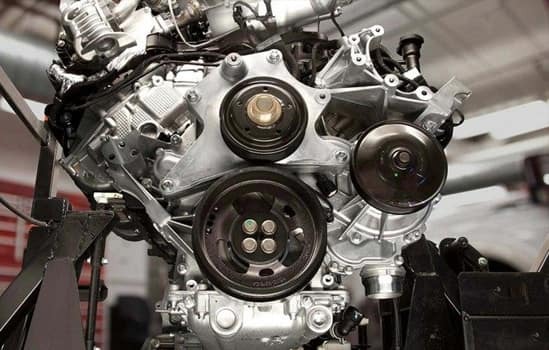 The 6.2L V8 is a flex-fuel engine, capable of running on E85 (85% ethanol, 15% regular gasoline); the available 6.7L Power Stroke® Turbo Diesel is B20-capable (20% biodiesel, 80% petrodiesel). 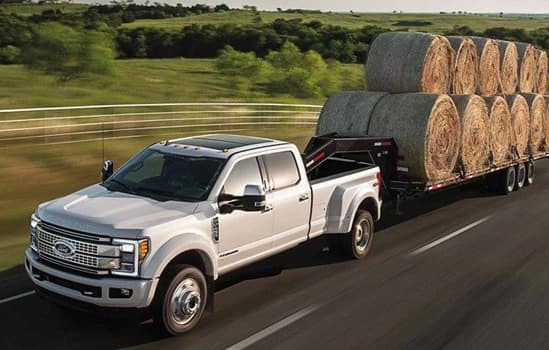 The Ford Super Duty® has a maximum conventional towing capacity of 21,000 pounds – higher than any other heavy-duty pickup. 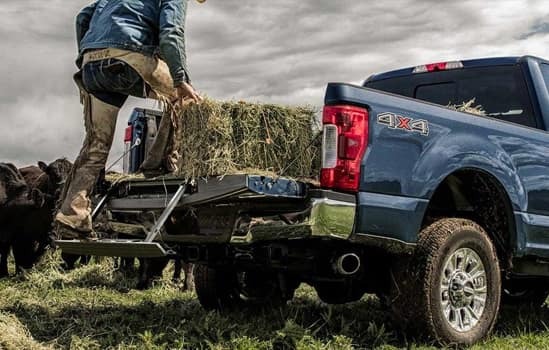 * Super Duty features a strong fully boxed frame made of over 95 percent high-strength steel; hefty axle, suspension and driveline components; plus a factory-installed weight-carrying hitch built into the frame. *When properly configured with 6.7L diesel engine. Class is Full-Size Pickups over 8,500 lbs. GVWR based on Ford segmentation. Need to tow the really big loads? 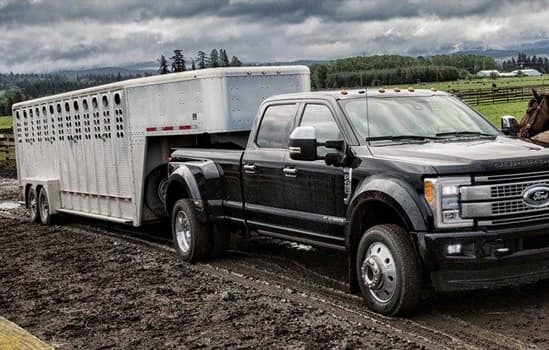 Hitch up with the Ford Super Duty® and either its maximum 27,500-lb. 5th-wheel or best-in-class 35,000-lb. gooseneck tow rating. The 5th-Wheel/Gooseneck Hitch Prep Package can set you up for this exceptional capability: Among the features is a 5th-wheel and gooseneck substructure attached to the frame (factory-installed on 4×4 model only). 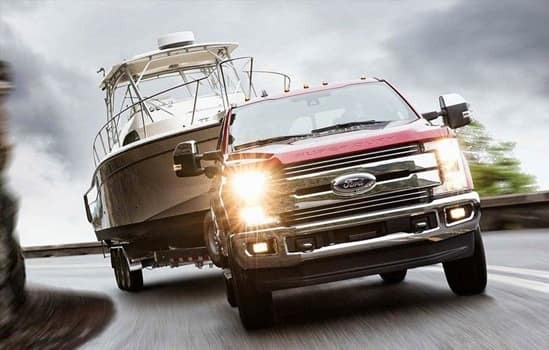 Compatible with 5th-wheel hitch kits and gooseneck hitch kits offered through the factory and Ford Custom Accessories. 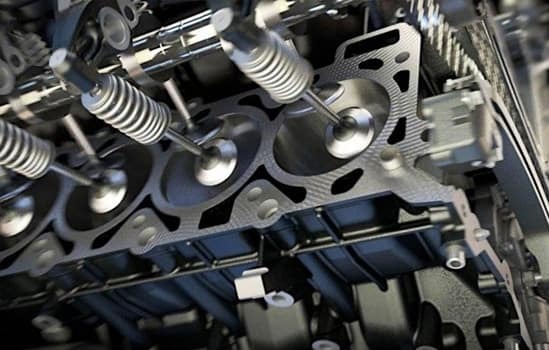 *When properly configured with 6.7L diesel engine and available factory-installed equipment. Class is Full-Size Pickups over 8,500lbs. GVWR based on Ford segmentation. The available class-exclusive* Trailer Reverse Guidance** enhances visibility via cameras in the sideview mirrors and visual guides in the center dash screen. You get a clear rear view of where the trailer is going, with the guidelines changing with the movements of the steering wheel. The camera view is digitally expanded to show the direction of the truck and the trailer. Now, one difficult task on the job isn’t so difficult anymore. **Functionality varies with 5th-wheel/gooseneck applications. See your dealer for details. Driver assist features are supplemental and do not replace the driver’s attention, judgment and need to control the vehicle. Available class-exclusive* Adaptive Steering adjusts the steering ratio in response to vehicle speed. 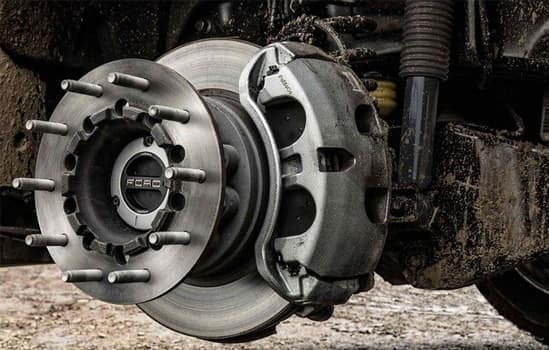 It adapts automatically to the driving situation, whether you’re doing a low-speed maneuver like parking or backing up a trailer, or traveling at cruising speed on the highway. At lower speeds, the steering ratio increases, requiring fewer turns of the steering wheel — and less steering effort. At higher speeds, the steering ratio gradually decreases, producing a steering feel that is firmer and more controlled. Thank you for shopping at Port Orchard Ford BT Performance. We've built a car buying process designed around you to save you time and money. If we don't have exactly what you're looking for, we'll help you find the right vehicle for your lifestyle. It's that simple. Call us today at 360.876.3000. 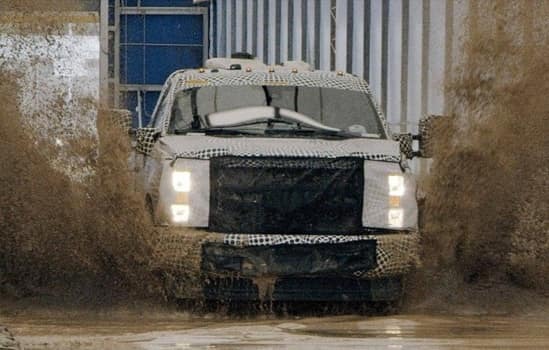 2018 Ford F-250SD Roush 4WD, 4-Wheel Disc Brakes, ABS brakes, Adaptive Cruise Control & Collision Warning, Adaptive Steering, Air Conditioning, Alloy wheels, Ambient Lighting - Fixed Color, Automatic High Beam, BLIS Blind Spot Information System, Brake assist, Delay-off headlights, Dual Extra Heavy-Duty Alternators (Total 377-Amps), Dual front impact airbags, Dual front side impact airbags, Easy Entry/Exit Memory Driver's Seat Feature, Electronic Stability Control, Electronic-Locking w/3.55 Axle Ratio, Exterior Parking Camera Rear, Front & Rear Wheel Well Liners, Front anti-roll bar, Front reading lights, Fully automatic headlights, FX4 Off-Road Package, GVWR: 9,900 lb Payload Package, Heated rear seats, Hill Descent Control, Intelligent Access w/Push-Button Start, Lane-Keeping Alert, Lariat Ultimate Package, LED Box Lighting, Low tire pressure warning, Memory Power-Adjustable Pedals, Off-Road Specifically Tuned Shock Absorbers, Order Code 608A, Outside temperature display, Overhead airbag, Overhead console, Passenger vanity mirror, Power Heated/Cooled Driver Seat w/Memory, Power Heated/Cooled Passenger Seat, Power steering, Power Telescoping/Tilt Steering Wheel/Column, Power-Deployable Running Boards, PowerScope Trailer Tow Mirrors w/Memory, Quad Beam LED Headlamps & LED Taillamps, Radio: Premium Sony Audio w/Single-CD/MP3 Player, Rapid-Heat Supplemental Cab Heater, Rear CHMSL Camera, Rear reading lights, Rear Stabilizer Bar, Rear step bumper, Remote Start System, Remote Tailgate Release, SiriusXM Radio, Snow Plow/Camper Package, Split folding rear seat, SYNC 3 Communications & Entertainment System, Tachometer, Tailgate Step & Handle, Telescoping steering wheel, Tilt steering wheel, Tough Bed Spray-In Bedliner, Tow Technology Bundle, Traction control, Trip computer, Twin Panel Power Moonroof, Ultimate Trailer Tow Camera System, Unique FX4 Off-Road Box Decal, Upfitter Switches (6), Variably intermittent wipers, Voice-Activated Navigation. *The advertised price does not include sales tax, vehicle registration fees, finance charges, and any other fees required by law. A Negotiable Documentary Service Fee in an amount up to $150.00 may be added to the sale price or capitalized cost. We attempt to update this inventory on a regular basis. However, there can be lag time between the sale of a vehicle and the update of the inventory. There is a $395 disposition fee for leases. All current incentives listed are purchase only. See dealer for lease incentives.